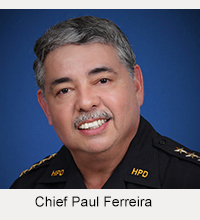 Eighty-nine youths from 10 teams participated in the HI-PAL “Click It or Ticket” Girls Basketball championships on the weekend of June 7-8 at the Waiākea-Uka gym. 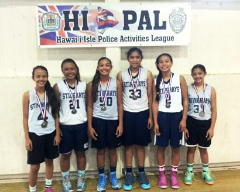 In the finals, Cherilyn Molina scored 14 points as the Kona Stingrays defeated Hoop Dreams 46-29 to claim the championship. Hera Salmon led Hoop Dreams with 12 points. Members of the championship Stingrays team included Molina, Mikayla Tablit, Tanniya Uchida, Grace Hing, Camylle Agbayani and Caylie Kaupu. For additional information on any Click It or Ticket or HI-PAL event, please call Lieutenant Darren Horio at 961-8121 or Officer Randy Morris at 326-4646 extension 258.